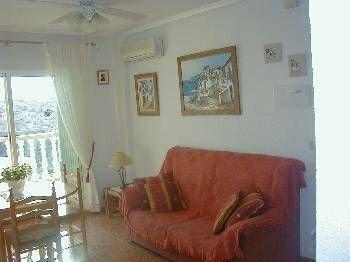 Two bedroom apartment located close to La Zenia beach south of Torrevieja on the beautiful Costa Blanca. This apartment is part of a 4 storey Molino Blanco complex complete with a community swimming pool.This complex is situated within a 10 minute walk from the beautiful La Zenia beach. This apartment comes complete with lounge, 2 bedrooms, 1 bathroom with showers, roof top solarium and balcony. The complex is adjacent to a supermarket, small shops,pubs and a wide variety of restaurants. Lounge; consists of air conditioning, satellite TV, and seating for 4. Roof top solarium c/w sun loungers and furniture and barbeque..
Balcony with patio table and chairs. W/C with shower adjacent to Master Bedroom. There are many attractions within the La Zenia area which will ensure that both young and old will be well satisified with their stay. - Huge theme park to suit everyone with many attractions less than 2 hours drive. - Many picturesque walks along the jagged coastline and parks. Monday (Morning) San Pedro 10 mins drive in car on N332 towards Cartagena. Tuesday (Evenings) Mil Palmeras 5 mins drive on N332 towards Cartagena. Our apartment is just a short 10 minute walk from the Zenia Boulavard shopping mall which has got many department stores and restaurants and cafes to browse through. There is a private roof top solarium which is south facing.